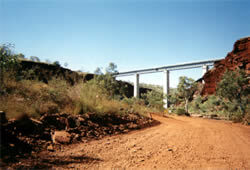 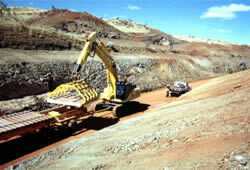 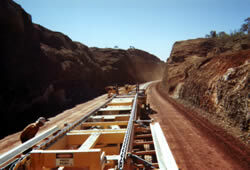 BHP Billiton Iron Ore Yandi to Area ‘C’ (Mac) rail project. 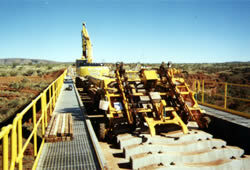 This equipment is not commonly used within Australia and is only available for specific new railroad construction. 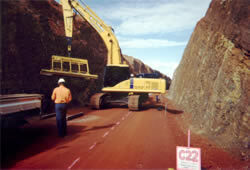 For the duration of the project our machines and operators were placed in situations that tested their abilities to work in confined spaces and elevated areas. 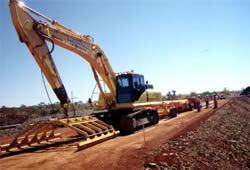 Having been trained specifically for this project, our operators demonstrated skills critical for the success of this construction program. 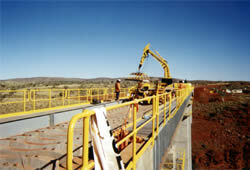 Operators were required to ensure productivity schedules were met whilst ensuring safety standards were adhered to. 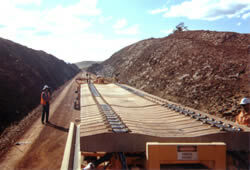 Our operators’ contribution to this project, which was carried out in a difficult and remote environment, led to its overall success. 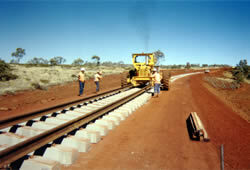 The completion of the project with Barclay Mowlem Construction Ltd pulling the rail into place.